ป่า / The Forest. 2016. HD. Mikres Afrodites / Young Aphrodites. 1963. Parallel stories of Eros set in 200 B.C. Nomadic shepherds, plagued by drought, happen on a fishing encampment with plentiful fresh water. The local men are away but will return when it rains; the shepherds stay to refresh their flock until the rain comes. A shepherd lad and a local girl, both on the verge of puberty, start a mating dance. Also, one of the shepherds approaches a beautiful local woman, inviting her to sleep with him. How will she respond? She's married, her husband at sea for the week. Is love forever or temporary? A subtext dramatizes the capture of fish, birds, foxes, and other animals: their fates seem arbitrary. Cast: Eleni Prokopiou, Takis Emmanuel, Kleopatra Rota, Vangelis Ioannidis, Zannino, Anestis Vlahos, Kostas Papakonstantinou, Stathis Giallelis. 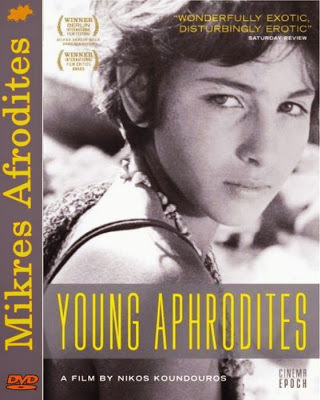 Download Mikres Afrodites / Young Aphrodites.